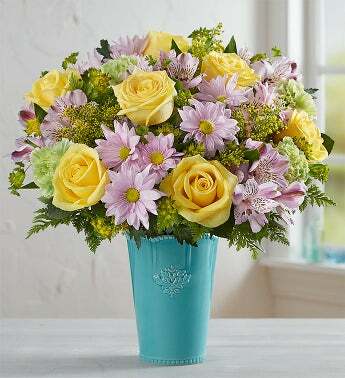 EXCLUSIVE Our Garden Sensation bouquet will brighten someone’s day with its sweet pastel colors. Bunches of yellow, lime-green and lavender blooms are loosely arranged inside our keepsake glazed aquamarine vase, inspired by handcrafted antiques. This striking vase flaunts an acanthus-leaf motif and scalloped edge trim with beaded detail, creating a charming-meets-chic centerpiece for any special gathering.